One Year Of Unimaginable Pain! A few days after Amy passed away so suddenly, I called my doctor. Surely there was something she could prescribe for this unbelievable foreign pain! I remember writing about this a few months ago because I will never forget her answer to my question on how to get through the unimagineable death of a child. “While I am not speaking personally, and am basing this on patients I have treated who suffered the same loss, it will be one year before you will begin to feel better.” Tic Toc, Tic Toc — one year is over — check. Blessed shock is pretty much gone; however, the PTSD still lingers and I was ambushed by a flashback as recent as yesterday. I do realize I need to return to therapy or find a good grief counselor to help me with this next year. I went to a reputable shrink the first 8 months; one who helped me prior to Devastation Day with my white coat anxiety. The last session I had with her ended badly with me having a panic attack as I exited her office after she sort of ambushed me with a question five minutes before my session was over. I could handle that question now, but at that time, I could not. Besides, she already knew the answer to the question. Do I get a certificate for surviving one year without Amy? Surely the continued pain can’t be my only reward?!? Oh wait, I am probably supposed to be reaping the benefits from my life lessons that losing a child teaches you?! Seriously, I know I have changed. Life has become more black and white? What would torment me in the past and recycle in my mind now most often lands in the “who cares” trash can. I am no longer equipped to play any ego games. My ego checked out on Devastation Day and hasn’t made a return visit yet. In my opinion our ego is just a bunch of distorted, over inflated images of ourself. Conjured up mostly by our wanna be self and injured by many when we bravely or arrogantly pretend to be all that we think we are. My ego chirped that I was an excellent Mom! Hmmm. Now my ego is deflated because one of my children is gone and surely an excellent Mom does not lose one of their kids if they were doing an excellent job? Yet, oh yeah, Amy’s death had nothing to do with me … On some level I do believe that but there is this faint nagging voice which comes from that lost ego who still makes me wonder if only I prayed differently, been a better person, learned my own life lessons faster … Would my youngest child still be here? The blinders have come off in my ever present grief fog which allows me to see the genuine goodness that exists in this world. There are people who have landed on my radar who have shown me pure compassion and genuine love. There are those who have said all of the wrong things and/or had unrealistic expectations of me and our communication has had to come to a screeching halt as they expected me to “get over” losing my child. A few weeks on the other side of Year One and they rent little space in my brain. Now that is progress. On the other side of Year One, I am still forgetful, very sad, long to see Amy, and wonder how much longer I can keep pushing myself to the level where I can exist in a world without Amy. Whenever I allow my mind to wander to the reality of what happened to her … suffocating, unimagineable pain takes over my mind, body and spirit. As I recently shared with my friend, Mira, I admitted that numerous times during the course of the day, when I am busy working or my mind is occupied doing something other than grieving, I get this breaking news flash of reality: Oh My God, Amy Died! There are no words to explain to someone not carrying this reality what that reality does to me. Last night I was sitting in my room working on a special shawl which I plan to finish today, when my eyes wandered over to my memorial bookcase we have in our bedroom which is totally devoted to Amy. I have tried not to make the downstairs into a shrine, but this bookcase is indeed a shrine. As I looked at Amy’s youthful smiling face with 100% knowledge of what happened, I truly wondered how anyone could ever expect me to get over my precious girl? What shrink will show me that it’s possible? My faith is returning and it does help me, but the cruel reality is still so fresh. One year of grieving did not change that. I am choosing not to go to our Compassionate Friends Meeting tonight. It is too much reality hearing them read Amy’s name on the August Devastation Day list as well as the August birthday list. Most times the meetings are helpful, but sometimes I understand why they are only once a month. Do me a favor and don’t remind me if this post is too sad. I already get that. Do me another favor and don’t suggest that another counselor is going to magically heal me as I have every intention of going back into therapy or seeking out a grief counselor when my energy permits. Please let this serve as a gentle reminder that I am allowed to be sad and depressed. I lost my Amy. I dump my personal thoughts onto this blog in an effort to release the pain. If someone grieving their child feels less alone because they share similar thoughts, then I am grateful I could help in a small way. But as I have maintained all along, this is not designed to be a feel good blog. It’s my own authentic journey on the other side of Devastation Day. I am not able to inspire in my broken state of mind, body and spirit. I am just trying to get through another day without my daughter without going crazy from the shattering reality and debilitating pain. Has the pain shifted after one year of heavy grieving? I would have to say yes. Am I better? No, it still hurts like hell! But like it or not life goes on even when you are living in the midst of your own personal nightmare. It is no easy task to live in a world without one of your kids. You do it because you have no other reasonable choice. Am I still pissed off? Not as much; well, not as much today. Can’t predict tomorrow. After one year of heavy grieving do I believe that Amy is in a “better place”? Yes! Did I always? No! But I do now and no one can take that away from me. Do I still think that love never dies? Absolutely!! I love Amy and Amy loves me. After one year of grieving, do I believe I will see Amy again? Yes! There is no other way for me to get through another minute without her if I thought otherwise so shame on anyone who tries to plant an element of doubt in this grieving Mom’s mind or heart. 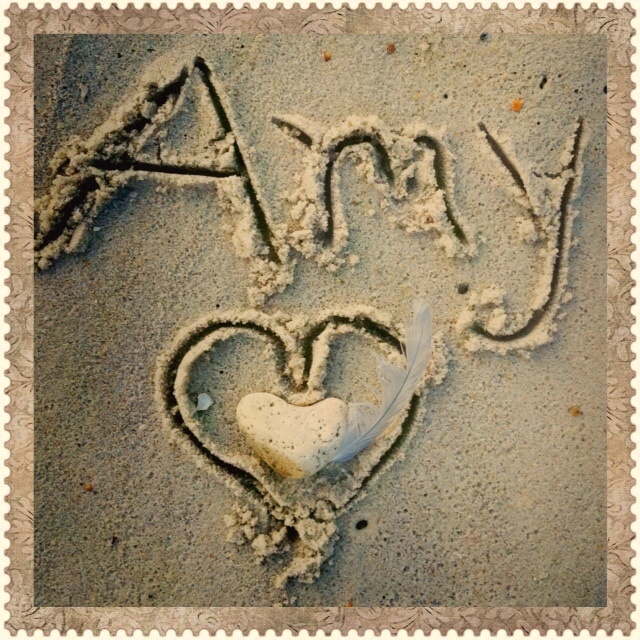 Always remembering my Amy and thanking my sweet friend for remembering Amy on her recent trip to the beach where she took the above photo. I know you are right yet I wish I could offer the hope I was looking for in those early weeks. The pain has shifted a bit now, but just as those farther along have reminded me, year two is no picnic either. Thank you so much for your comment. Dee, I don’t think it is fair to give you some kind of unrealistic expectation of “when” the pain will be gone. A year is hardly enough time since it marks all of the first seasons without your child. It eases in time…your own time. I know you are eager to “not feel the pain” so intensely and it will indeed happen. Because we know that this is not the end…that our children are more alive than ever…we can bear this with God’s wonderful help. Sending hugs of love. Dee, I’ve been thinking of you so much over the last 2 weeks. I’ve been amongst the clouds in the West and seen so much beauty. I’ve also seen a TON of feathers and even though I didn’t know your Amy, each one made me pause and reflect. Wishing you some peace my friend. What does time mean any more? One year, two years? It’s every day Philip’s not here and what that does to me is something only another grieving parent understands. My powerlessness is astounding. He’s not coming home and I can’t do a thing about it. I try to remind myself that Philip is spared the suffering that comes with this life – the suffering that to me, outweighs the “happiness.” It’s a hard world; may I learn not to be selfish about his death. Philip’s in no pain – he perceives differently now, but no matter how much he comforts me, I’m still cold and alone. You will grieve as you need to – no one can take that away from you, and you wouldn’t want them to. We are truly the walking wounded, Dee. And I wish I had something really smart to say. I don’t. Just reaching a hand out to touch yours that we might be just a little less alone.